In the Philippines they have this expression: hala. I know you want to say it this way, but it’s not holla. And it’s not hah-lah. It’s more like, hulá. Which makes it sound like hoola, which is also not correct. Fail. It’s just huh-LA, and by now I hope you’ve tried to say it outloud at least once. It’s kind of a cool way of saying “Oh my gosh” or “I can’t believe it.” For example, the girls in my class would give me a good huh-LA! when I would assign them extra homework. Heads whipping up from tables, eyes popping wide open, and a nice passionate huh-LA always gets the point across. Huh-LA can also be a good thing, like “This is amazing!” Like when we made gingerbread houses at Christmastime with the kids and the preschool viewing parade came around to the back table to find that the boys group had created not a house, but an open-air tropical mini restaurant with candy, frosting and graham crackers. That’s a huh-LA moment in the life of a preschooler. And/or food blogger teacher. When I saw that picture of those crumbs and that yummy farmer’s market rhubarb and those cutie strawberries today, in my mind I said: huh laaaaaaa. That looks good. And then I felt a little sad about not being in the Philippines. This beautiful paleo strawberry rhubarb crisp lived a full life of about 5 minutes before being devoured by me, Bjork, and Bjork’s friend Paul, while watching Zero Dark Thirty. Totally appropriate girly dessert/superintense movie pairing. Know what? Two men unknowingly devouring a homemade paleo fruit crumble and loving it is mysteriously satisfying. I honestly wasn’t trying to trick anyone but I found myself smugly smiling from the kitchen and intentionally withholding the knowledge that this was “healthy”. Evil me. So the elephant in the room: this is a paleo recipe. In my head I say it pah-LAY-oh but I think it’s actually PAY-lee-oh. Which ultimately gets to the bottom of what I want to say which is that I’m not a paleo person. Paleo usually means you only eat these things: meats, seafood, vegetables, fruits, and nuts. I’m more of an everything person, but I really love trying new things like being paleo for one dessert. When my cousin (technically cousin’s wife so therefore cousin in law?) sent me this recipe, I got excited when I saw ingredients like coconut flour, almond meal, arrowroot powder, and coconut oil. It justified a trip across town to the fancy grocery store that has carpet and sent me on a new food adventure. Bjork was hooked on the cinnamon-honey smell that overtook our house in .3 seconds after taking it out of the oven. This is kind of a drier, almost more moist cake-like fruit crumble, not like your super saucy apple crisps or berry cobbler type things that just completely overtake the whole plate with fruit juice. The top on this gets crispy, and the bottom soaks up the sauciness of the fruit, and the fruit is extra sweet and soft, leaving you with this sticky, yummy, just juicy enough strawberry rhubarb miracle. I usually skip the obligatory scoop of vanilla ice cream with my desserts, but this time I felt brave and I added it. Ten stars, you guys. It gave THE PERFECT texture and creaminess to this crumble. Because at the end of the day, I’m still an everythingtarian who loves her Haagen-Dazs ice cream. 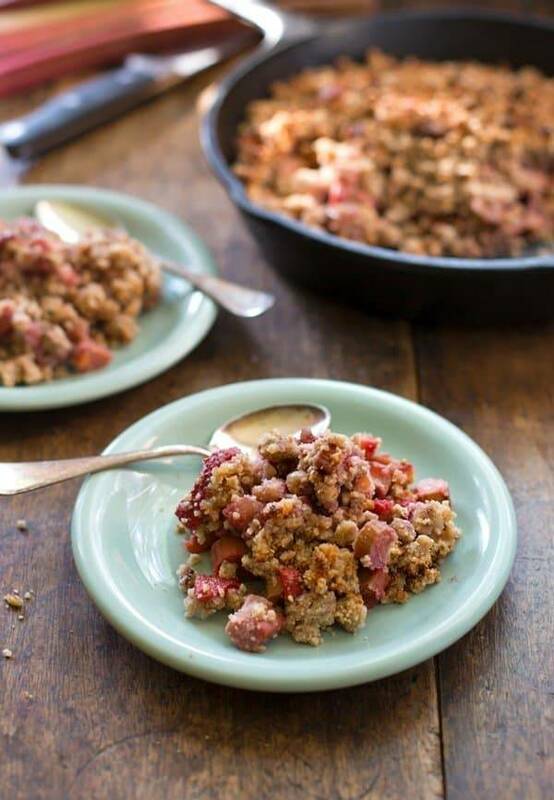 This paleo strawberry rhubarb crisp was a total hit with my husband who had no idea it was anything different than the original. Yummy! Are you paleo? Would you ever make something paleo, just because you’re food-curious like me? Speak your food truth, friends. And on a completely unrelated note, we have a winner for the Tasty Food Photography ebook and food photography prop kit giveaway! Entry #773, Pat S, it’s your lucky day! You have an email waiting for you. Yum…. this crisp looks absolutely delish….Paleo or not! I’ve dabbled with eating Paleo for about a month, but there were way to many “healthy” foods that I missed. I do occasionally cook all Paleo dishes. I will definitely be cooking up this one, at some point. Same here! Cheese back at ya. This sounds unreal! I’m definitely not Paleo, but I love the look of this anyway! So since it’s Paleo, that means I can have more than just one serving at a time…right?! Uh, I made a Paleo rhubarb strawberry crisp as soon as I got my spring rhubarb. Don’t know if it was this recipe or not, but am responding to the no seconds on dessert question. My husband refuses to eat my healthy desserts!! So I have to eat it all. It took all week and I had a couple servings a day. When I went in for a follow up doctor appt a couple weeks later, I lost a pound! Coconut flour helps you lose weight 😊 Thanks Lindsay! I am making this today. I like an excuse to use fancy ingredients — doesnt matter to me that it’s paleo, just that I get to work with something not 100% in my comfort zone. Plus this looks DELICIOUS. Still never had rhubarb, but man oh man I need it now!! This is beautiful!! 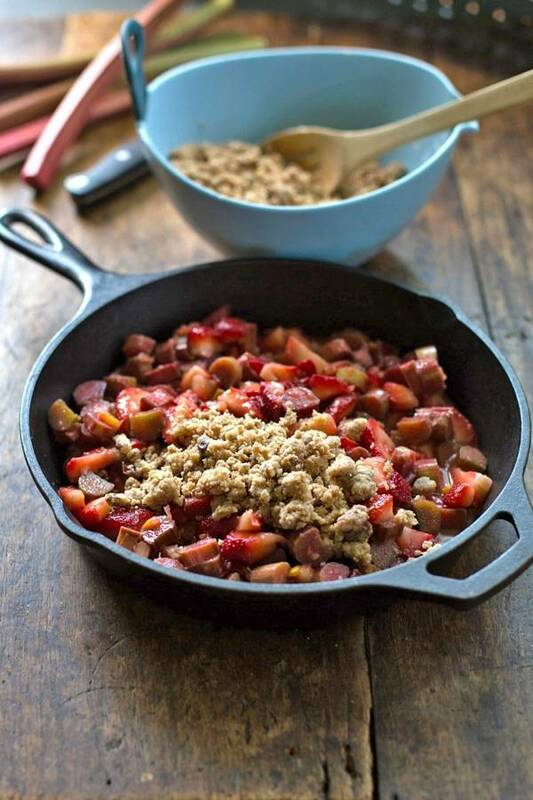 Must go find some rhubarb and make this for breakfast. Seriously. WHAT?!? Girl. Get to your farmer’s market and buy some. It’s really sour/gross most of the time but when baked with honey and crumbles and other good things, it transforms. I just harvested rhubarb out of my garden. My first rhubard cooking experience is going to be this dessert. I am primal, so I was wondering what on earth I was going to do with it. Looking forward to eating it… looks wonderful! Yum! I’ve been wanting to experiment more with rhubarb and I think this is the recipe for me! Looks delicious! Yum, yum! This looks delicious! I started eating paleo about a year ago. I would say I’m about 85% paleo/gluten-free and 15% of….give me my pizza and Ben and Jerry’s New York Supreme Fudge Ice Cream (minus the white chocolate chunks). I believe strongly in the paleo way of eating. I feel better, sleep better and I did shed a few pounds when I first started the paleo way of eating. However, I couldn’t live by it 100%. A true paleo diet you are to avoid starchy veggies, dairy, and legumes. For me, I can’t pass up corn on the cob, sugar peas from the farmer’s market or to think of chili without beans….no way! A girls got to live :)! Sounds like a really healthy balance Julie. Thanks for sharing! Just finished my “Whole 30” by Melissa and Dallas Hartwig. I’m not adding sugar just yet so I’m going to make this recipe Whole30 compliant by replacing the honey by chopping dates! We’ll see how it turns out! Great idea, Micheline! Hope you enjoy it! This rhubarb recipe looks great. 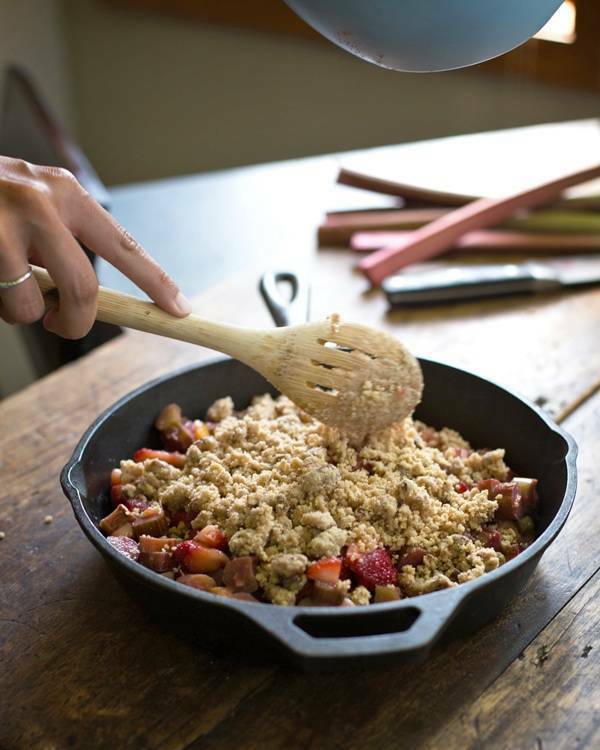 How did your rhubarb crisp turn out ? I too want to use dates instead of honey so how many dates did you use? Was it a good exchange? Hala! Mukang masarap! I would eat this and listen to Prairie Home Companion. i’m not paleo, but food curious for sure. and…a serious rhubarb fan. just might have to try this. And you honestly don’t even have to be paleo to love it. Coconut flour, almond meal, honey… mmm! I’m definitely not on the paleo wagon, but this looks delicious no matter what! YUM! I love the strawberry-rhubarb combination and I just so happen to have a big ol’ bag of arrowroot powder that I bought for a recipe and haven’t known what to do with it since, so this sounds PERFECT. The only trouble is, my husband is not a fan of baked fruit deserts. I guess that means it’ll all be for me! Yes! I love that you used your cast iron skillet for this recipe! I don’t think I’ve ever tried the strawberry/rhubarb combination but I’ve heard it’s a great combination so I should give it a try. I feel the same way with you about paleo – I’ve dabbled in it but I can’t stick with something like that. I enjoy too many foods. I’ll be pinning this recipe. Thanks for sharing! Damn that looks good and Paleo too boot!!! Nice! I’ve been playing with Paleo recipes lately, so I have everything here except the rhubarb. This looks SO good. What?! You paid money for rhubarb? It’s growing like weeds at my house and I can’t even harvest it fast enough. Seriously, come over and pick some this week. You can even pick tiny, perfect strawberries from our little patch. Thursday or Friday work for me. I can’t wait to make this! I made a strawberry rhubarb pie this season and I’ve been craving it again– this is a great alternative to making the whole pie again! I’m new to cooking with coconut oil. 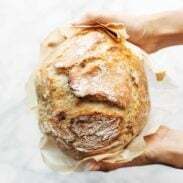 Do you melt it first then add it to the dry ingredients, measure it out in it’s solid form and add to dry ingredients? Nope – used it in solid form! It’s kind of like butter, actually! You had me at strawberry, almond and coconut flour. Seriously. I can just image the smells as you were making this. Am new to rhubarb – have only tried it in a couple of fruity dishes – but this looks way better than what I turned out! I, too, am having trouble finding it here in Georgia – even tried a couple of local farmers markets. Can I use frozen instead? I think you could! Except it might be a little more watery so maybe just make sure to thaw/drain it first.